Owning an inflatable hot tub should be easy. We all want to take the cover off, turn on the massage system, and get in for a great massage and relaxing soak. However, if we’re not careful, it can end up costing us a lot of time, effort, and money. So what we all need are some ways we can save in each of these three areas. Here, then, are 11 of our own easy inflatable hot tub tips that are designed to do just that: save you time, hard work, and money. Inflate your hot tub to about 95% capacity. This is because the water, heat and even the sun will increase the air pressure in the walls of your inflatable hot tub. This in turn means the air will expand a little, and the hot tub will inflate itself to the desired level. Bear in mind that if you have a black hot tub, then this colour absorbs light and reflects none of it (that’s why it’s black!). As a result, black absorbs the most heat from the sun. So if you do have a black hot tub, like many MSpa hot tubs, then they will absorb more heat from the sun and the water inside the tub, so the air inside the walls will expand even more. Try this tip out a few times and see how it works out for you. You’ll soon learn the best inflation level for your particular hot tub. 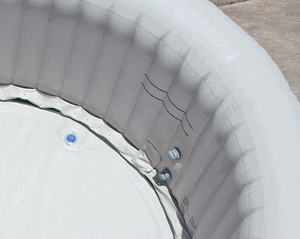 You’ll see the minimum-fill and maximum-fill lines on the inner wall of your inflatable hot tub. We always advise our readers to only fill their hot tub up to the minimum-line, especially if they are first-time owners. This is because you need to leave room for the water to rise when you and your other hot tub users get in. On top of that, you need a little room for the water to bubble when you turn on the massage jets. Filling the hot tub to the maximum-line is fine in most cases; but if the water reaches the top of the hot tub when you all get in, and then splashes over when your turn on the air jets, you are wasting expensive hot water. The chemicals in the water could also harm any grass and plants around your hot tub. Also, by filling your inflatable hot tub only up to the minimum-fill line, you are saving on the amount of water required, which in turn requires less heating. These alone will save you time and money. It’s actually cheaper – and works out quicker – to fill your inflatable hot tub with hot water from your household supply. That’s because no matter how good your inflatable hot tub motor is, it can’t compete with your household heating water system for speed or efficiency. Just remember to add an inch of cold water beforehand, to protect the vinyl floor of the hot tub. Also, check the temperature of the water as it comes out of the garden hose, making sure it’s not above 104F. This is the industry-standard maximum water temperature for inflatable hot tubs. If it is hotter than that, add some cold water to your hot tub first, so it cools the hot water as you fill it. Also, if your hot water is above 104F, make sure it doesn’t play directly onto the hot tub liner. If you need to run the heater for more than just a quick burst, it’s a good idea to check with your energy supplier to find out the times of their cheapest rates. These are most likely to be after midnight and before daylight, so this would be a good time to heat your water. Then your inflatable spa will be ready to use at the start of the day. If you’re concerned about disturbing household members or neighbours with the sound of the heater as it runs at night, then don’t worry. Most inflatable hot tub heaters run at under 60 decibels, which is about the same noise as a normal conversation or a small air conditioner. With many inflatable hot tubs, you have to choose to have either the heater on or the massage system. In which case you can skip this tip. A growing number of inflatable hot tub, however, have advanced motor units which allow you to run the heater and massage system at the same time. If your inflatable hot tub has this option, then it’s important that when you’re heating the water you turn off the massage system. That’s because using the massage system cools the water a little, due to the increased air surface of the water caused by the bubbles. And an increase in surface area means more evaporation of heat. So leave the air jets off when you’re heating the water or even if you giving it a lengthy boost to top it back up to your target temperature. As you can see in our article Money Saving Tips For Inflatable Hot Tub Owners, it’s a good idea to keep your inflatable hot tub heater running continuously if you use your hot tub three or more times a week. If you do, it’s best to set a lower temperature on your digital control panel while you’re not using your hot tub – we suggest 96F. Then, an hour or so before you want to use your hot tub, set the temperature back up to your target temperature. When you get in, the water will be nice and hot. Make sure the chemicals in your inflatable hot tub are at the right level by checking the pH of the water once a week. If the level is fine, then no worries. If the level is too high or too low, then adjust the chemicals in the water to the correct level. If you fail to do this, or if you wait too long to test the water, then you will most likely have to spend a lot of time, effort and money on shocking your hot tub down the line. You might even have to drain it, give it a thorough cleaning, and then refill it all over. It’s easy to prevent this unnecessary task by checking the chemical levels regularly. 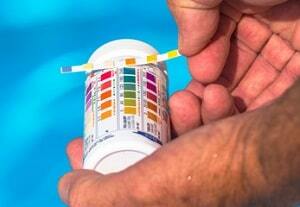 If you have any questions about how to test the pH levels of your water, then follow the guidelines in our article How To Test The Water In Your Inflatable Hot Tub. It’s always a good idea to wipe down the external surfaces of your hot tub with warm water and a soft cloth once a week. At the same time, wipe the inner surface of your hot tub cover and also around the water line, to clear any build up of chemical residue and grease. If the residue is hard to remove, then most hot tub owners use a special inflatable hot tub surface cleaner such as Citrabright Surface Cleaner by Leisure Time. To save money buying a specialist cleaner like this, however, you can try using a little white wine vinegar on a soft cloth. This is astringent enough to cut through any grease and chemical build up, and it also won’t harm the pH level of the water, as long as you use it sparingly. One of the easiest things you can do to prevent a build up of oils and grease on the surfaces of your inflatable hot tub and the cover is to put something in the water which soaks up these contaminants. One excellent option is what is called Scumbugs. These are available over on Amazon, and are special sponges which float on top of the water and absorb the grease and oils that accumulate in the water from regular use. They are shaped like a children’s drawing of big insects – giving them their name – and they’re an economical and time-saving way of keeping your inflatable hot tub water and surfaces clean. 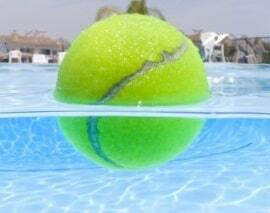 A weird and cheap alternative is to put a new tennis ball into your hot tub. The fibers of the tennis ball act in the same way as the Scumbugs, collecting oils, grease and other contaminants and trapping them in the fuzz of the ball. An added advantage is that both the Scumbugs and the tennis balls are washable. So once they look or feel a little slimy, give them a good wash in hot water. If you use detergent on them, to clean them, then make sure you rinse them thoroughly so there is no detergent left before you put them back into your hot tub. Your inflatable hot tub filters play a crucial role in keeping your water clean and helping your hot tub run efficiently and economically. They work by filtering out any impurities. Therefore, it’s important you keep them clean so they perform efficiently. You can rinse the filter cartridges with a powerful jet of cold water from your garden hose or by rinsing them under your faucet. This will be enough to clean them as long as you do it after every time you use your hot tub. You can also buy a special filter cleaning brush and cleaner to deep cleanse the filters; however we find putting your filters in your dishwasher and turning the dishwasher on (without adding any detergent) is just as effective. Keep in mind that cleaning the vanes of your filter cartridges will eventually wear them away, so you should replace your filter cartridge every month or so, depending on how often you use your inflatable hot tub. For a more comprehensive guide, check out our article How To Clean Your Inflatable Hot Tub Filters. It’s important that every hot tub user showers before they get into your inflatable hot tub. This is to wash off the natural oils that build up on your body as well as any deodorants, moisturisers, shampoo residue, and so on. By removing these before you get in your hot tub, you’re helping keep the water clean and free from contaminants. This means the sanitizer has less work to do, so you won’t need to replace the chemicals so often. It will even reduce the need to shock your inflatable hot tub to remove the build up of organic matter. Finally, making sure the water stays clean by showering first helps your filters last longer, and increases the lifetime of your pump as it has less work to do. If you need more tips on keeping the water clean, you might enjoy reading our guide How To Keep The Water Clean In Your Inflatable Hot Tub. We hope these easy tips and ideas help you enjoy your inflatable hot tub even more. The one thing we want to avoid is for our ownership of a portable hot tub to become a chore. After all, we bought it to help us relax and have a great time! Using some of the advice we have here should help you have an easier time owning your tub – it sure helps us. Thanks for reading!